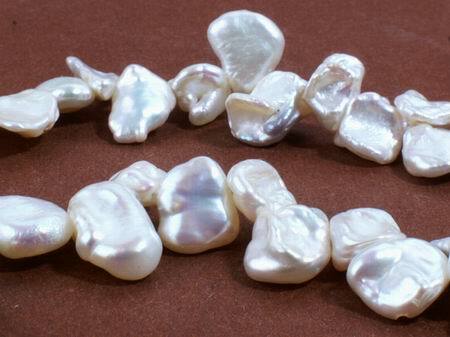 Price is per 15-inch strand of these unsual pearls. Each measures about 8mm x 7mm x 3mm, drilled ready to thread. Keshi pearls are very much in demand! Keshi pearls sometimes are also called "cornflake pearls" because of the unusual shapes. You may find these same pearls described with a variety of spellings, too, such as "Kashi", "Keshi" or "Keishe". Keishi pearls are formed when the mollusk ejects the pearl bead nucleus but continues to make a pearl.